Skip Counting is a great way to start familiarizing children with multiplication. It's basically counting by other numbers instead of by 1’s. Using 3 for example, the numbers that would be counted would be 0, 3, 6, 9, etc. If you can count by that number, you can multiply by that number. For example, if you wanted to multiply 4 x 3...all you would have to do would be to skip three times...4 8 12. So 4 x 3 is 12. 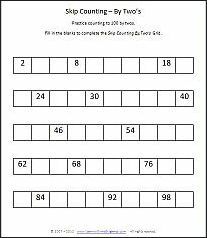 Count By Twos: Here's a worksheet that will help young learners count by twos and then multiply by twos before you know it! Kids will enjoy filling out the missing boxes in this grid below. The grid has some of the numbers there to help them if they are just learning their multiples of two. Online Count: This is a fun activity that helps kids practice online! Choose the number you want to count by. Click on the correct number and earn points. Clicking on the wrong number you lose points. Multiplication is an important math skill kids should master without a calculator or using their fingers!. If you your child or students are at a point where they are ready to start learning to multiply, they will really enjoy learning with fun multiplication games.